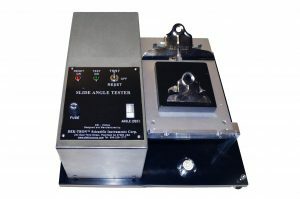 The Coefficient of Static Friction Tester, known also as the “Slide Angle Tester.” The instrument is precision crafted with quality and durable parts. The design provides a constant and precise movement of its sliding plane as specified by the above Referenced Test Methods, The Coefficient of Static Friction is found by placing the prepared sample on its movable plane. The test begins by pressing the switch button. As the test begins, the plane starts moving up from its horizontal position and coming to a stop at the precise moment the sample begins to slide; at this instance, the resulting angle is recorded. Two types of units are offered, a Manual Type and a Computerized Type. Both units provide precise results and are easy to use. The Following are Just Some of Its Applications: Corrugated fiberboard, solid fiberboard, writing paper, printing paper , packaging materials, materials for shipping, shipping containers, electrical insulation paper materials…. etc. 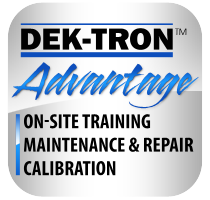 All DEK-TRON Instruments includes the DEK-TRON Advantage! !